Price includes all four panels. Made in USA. Lifetime Warranty. SHIPPING NOTICE: Sales of individual small panels has increased significantly in recent weeks and our inventory is low. Orders place today may not ship until the week of April 30. Thank you for your patience! In the 2015+ F-Series lineup, each truck bed is equipped with four mounting points, know as the Boxlink system. Sadly, these don’t offer a great deal of flexibility when it comes to storing a variety of items. The BuiltRight Modular Bedside Rack System installs using these same factory mounting points, without the need for modification to the vehicle. The panels provide MOLLE-compatible features for the use of MOLLE/PALS accessories in addition to universal slots for an infinite number of possibilities. 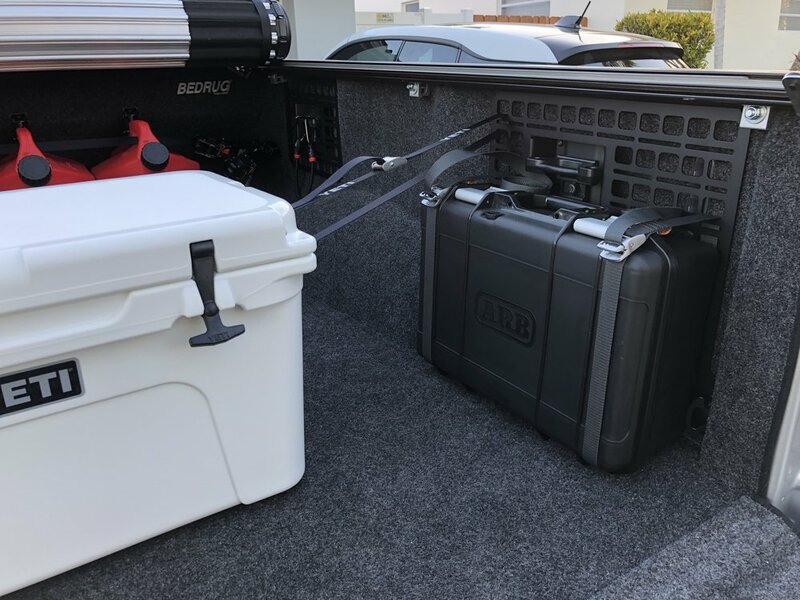 * Fitment Note: At this time, we cannot confirm fitment compatibility with all drop-in bedliner systems, as the various manufacturers take different approaches that are difficult to account for. The same applies to some hard cover tonneau covers with clamps that can't be repositioned. Some customization may be required in those cases.